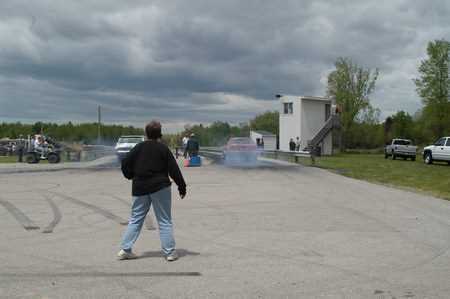 Video Clip: See lady drivers doing burnouts! Yeah, I understand Travis, but the owner will not budge on this track. Many people have tried, but this guy just doesn't know what he wants to do. So we are apparently in limbo. Someone please get this place going atleast run it 1/8 mile. It would be so great, especially living so close. I was reading this page about thunderbird and called the phone # and ask about teh drag strip. said it was closed and being removed and torn up as we speak. I asked about teh owner and was told it was Roman maciniac from Spring lake. What a shame. Hi Jeff. 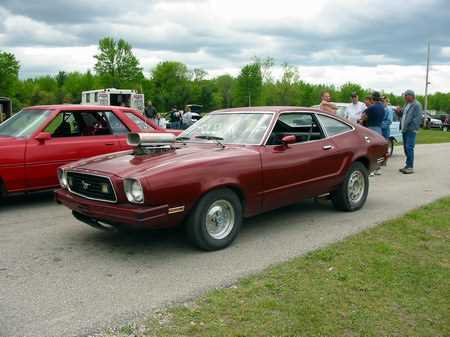 i dont no but we are in need of a dragstrip in muskegon the cars are here. racingfan , how much is he asking i know someone that would be interested in a strip. It is time to move on. It is time to get the drag strip back open. Larry Eaton wouldn't want the track closed because of him. If the owner doesn't want to open it he should sell it. But not for the outrageous amount of money that he is asking for it. The price of the land next to a circle track is not worth what he is asking. You can't build any thing else there. So in closing let's move on. Open the track and the drivers will come. The strip has been shutdown due a driver getting killed there. Is Deer Hunting season still on here in Michigan? How many hunters die during that short season ?? How many die on our roadways every year?? Dumb reason but I have checkked this track out myself. The gaurdrail stops but there are still a few post sticking just past that. End of the track could use some improvement. Yes limiting the ET for vehicles racing there would help. Our High School Students are limited to 12 sec ET. It''s better than some back county road. what will it take to get the dragstrip back in action? Even if you limit it to 12 seconds or slower. Still be a great place for street cars to hang and race. Martin has too many big events this year. T&ts are less and less. I always loved making passses at the bird. friendly down to earth people. freinds of mine went to ubly ,they said it was a lot more bumpy than thunderbird. The circle track is still in operation, but after Larry Eaton''s tragic wreck the dragstrip is closed. Personally Eaton''s car was obviously and overwhelmingly FAR to fast for that track and anyone who has ever seen Thunderbird raceway and Eaton''s car could tell you that. Ten years ago my car was running low elevens and I was uncomfy at the ''Bird. 06-29-09 Is this track still open? I will be in the area from 7-3-09/7-13-09 would like to check it out. I have been @ every dragstrip in Mi except this one. I don''t know why they would shut the strip down. look at how many people have been killed at Milan and how many accidents they have had and they never closed. people must understand that when you get in a race car and go over 100 mph that your life is hanging by a thread, that your car is just a machine and any thing can happen,every time you go down a track it could be your last. just like a sky diver every time they jump it might be the end, no guarantee the chute will open. it is too bad when someone gets hurt or killed at a track but when it happens they should not try to blame the track, it is a decision that the person made to risk their life. I heard the same thing , also i heard one of the big tracks in mich. has some $$$ problems and might shut down. Does anyone know what''s up with this track? Is it still open or not. I heard that since Larry Eaton got killed they closed the strip, although the circle track is still open. I hope this isn''t true. We don''t need any more bad news this year. I worked ems. for 26 years on ambulance and when some one is hurt that bad ther usually not much ems can do unless they are bleeding, but to secure them get an iv going and get them to the hospital. but it would be a good idea to have an emt there to stop the bleeding and give them o2 till the ambulance gets there. I want to pass on my condolences to the Eaton family. I did not know Larry and never saw him race, but my prayers go out to his family. God Bless. Well, on a sad note Larry Passed away. Funeral is this Thursday. No racer likes to hear this type of news. Larry was a great person and a good friend. Regardless if it was the drivers fault, too fast of a car, or dirt on the track. the fact remains that EMS should have been standing by. All strips should have EMS standing by. No one signs away there right to life. My heart goes out to his family!. Maybe some of you folks are reading my comments the wrong way. I am NOT saying that we don''t need to think about safety or make improvements. But, to me if your gonna go to all the expense of A. building a car to run a set time you have in mind, B. pay all the money to do so, C.
pay all the money to haul it up to whatever strip you want to go to(for me they are all at least 45 miles away)I would want to run on a 1\4 mile track as that to me is still the standard of the sport and that should never change. I can see where some places (like Englishtown) have simply developed other properties too close to the strip to modify/change the shut down area for the really fast cars, but to me that means that the NHRA/IHRA need to look at moving to some other tracks where that is not the case. 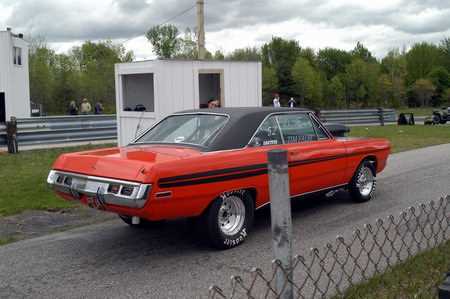 I would think a track like Thunderbird (out in the middle of no-where) could be bought and developed by said sanctioning bodies for much less than it would cost to develope/re-make a Englishtown or other track where it is surrrounded by mass populas. Yea, I know then no one will want to go and race there because it''s too far out of the Big Cities, but that is what it will take, because as more people wish to live in large urban areas, land for race tracks around these areas will be EXTREMELY expensive to aquire, let alone build on for ANY race series. We can''t have it both ways. Randy, simple fix cut the speed zone to 1/8 mi. like ron said. the cars are all going to fast to run 1/4 mi. I have to say, of coarse safety should be the #1 concern of the tracks. BUT there is the reality that racing (drag & stock car) is and always has been a very dangerous sport. It is part of the element of racing. Of coarse there are ways being developed to help improve the safety factor as you see being implemented in NASCAR (soft walls, car configuration, etc). But the tracks (dragstrips in paticluar) that were built back in the 50''s & 60''s are still being used today for cars going almost twice the speed of what they were back then. Just in my opinion, the tracks need to look at ways to make things safer. I know it is hard as I am no expert. But like at Englishtown, having a retaining wall at the end of the track due to the public road there is something to rethink. If the tracks are not safe for cars like that, then they should race somewhere else where this would not be a factor. I know reconstructing shut off areas and other improvements are costly, but there is no price of a major injury or someone''s life. I think a run off area with sand or gravel would be helpful to some degree and maybe numerous catch type fences (break thru type that would slow the cars down and not an abrupt stop). but again, I am not an expert or specialists at track safety. And I do know some tracks have this in place already, but to modify or even reconstructing them. I love racing (of all kinds) and do hope that some kind of improvements relating to safety can be developed for all tracks and competitors. I have read with interest about the on track crashes at tracks around the state and the country. It is ironic that I write about this as we just today have lost Scott Kalitta at Englishtown. But still I think something needs to be said about the lack of saftey in/at tracks and the need to limit speeds and the length of the tracks. The bottom line is simple: If you think it''s too fast and you fear for your saftey, DON''T RACE! NO ONE is holding a gun to your head and telling you to! We ALL KNOW the risks involved in this sport. They were saying the same types of things over 30 years ago. But if you look at this sport, it would not be the same if you limit the speeds/distances. THAT''S WHAT MAKES IT SO DAMN COOL! If it were a nice safe sport like billiards, nobody would care as much to watch it. Speed is a risky buisness and if you don''t think so, you will most likely end up dead. But it is this risk that excites us to do this type of thing in the first place. Cries and plees to limit the speeds and the distance to race will be the death knell of the sport. Just an opinion, but think about it. Too bad about Larry Eaton''s crash at Thunderbird, this is one reason the race tracks must take it on themselves to limit speed. It appears to me that IHRA and NHRA must be brain dead and don''t care. with the speeds the cars are running today, the tracks should impose a rule anything that runs 11. 99 or faster can only run 1/8 mile and any thing that runs 12 sec. or slower can run 1/4 mi. It seems all the wrecks are at the 1/4 mi. where the cars are all wound out and have nothing left. look at all the accidents at MILAN. this should be a fun sport not feel like you are taking your last ride every time you go down the track. Larry, I am glad to hear they are getting a few more cars. I was there the end of Aug. and the day I was there there was only 17 cars and the fastest time was 13 sec. The return road was so rough it about shook my car apart. do you know if they ever fixed it? Thanks Kurt. Hey Josh Z on wed nights its grudge racing and T n T the cost is 15. 00 for car and driver for as many runs as you like. 5. 00 for spectators. we have been starting at around 4:30 but anyone is welcome to come as early as you like. we usually the track until the snow falls. you may also have a passenger in the car after the waiver is signed and keep in mind in some cars helmets are required. we have been pulling in some good crowds and fast cars the last few weeks. pretty typical end for us as the other tracks are winding down and most are not ready to put the cars away yet. we are having a fun day/end of year party with T n T and maybe a gamblers race if enough cars want it on Oct. 20 th , not sure on times yet. all are welcome to contact Chuck at DESBIRD@MSN. COM or call the track at 231-766-3300 for info. track has been decent with mine running 11. 40 s and my nephew running 10. 08 with his juice. as my family and i are all mustang racers , we would love to see you bring yours out!. Josh, you can run but it aint going to be small $ it will be BIG $$$$. i was wondering if on wed. nights if the deal was that anyone can come and race their car for a small amount of $. i just got a 5. 0 mustang with some mods and wanted to give it a run and see what it will do cause im puttin 5 grand under the hood over the winter. if anyone knows please let me know before the season ends. 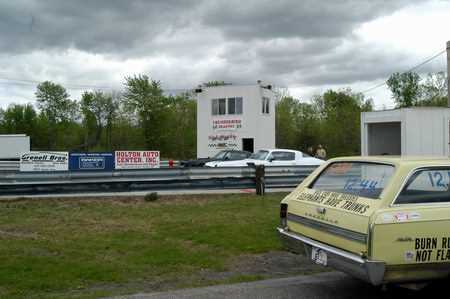 Jim & Frank, The Dragstrip is open for TEST AND TUNE on Wed''s but not on Sundays as the season is over. I spoke to lady there and she said they WILL BE OPEN NEXT YEAR AS WELL. This is the # (and I called on Monday and they answered) PHONE: 231-766-3300 WEDNESDAYS test & tune (dragstrip). Jim,I think that they are finished no phone,no email, no one to contact. I went by and the place is so run down ,and it don''t look like it has even been open this year. too bad another track gone. Dose any one know if the dragstrip is open?and when do they run if it is?. CHUCK, DON''T WORRY ABOUT THE TRACK BEING ROUGH. ANY TRACK IN MICH GETS ROUGH TWO YEARS AFTER RESURFACING THEM,IT CAN''T BE HELPED THE FROST IN THE GROUND HEAVES THEM. YOU WOULD HAVE TO RESURFACE EVERY TWO YEARS TO KEEP A TRACK SMOOTH. JUST TAKE A LOOK AT THE STATE ROADS. DON''T LET THE CRY BABIES GET TO YOU. NO MATTER HOW GOOD YOU FIX THINGS UP IT WILL NEVER BE GOOD ENOUGH FOR THEM,THEY WILL ALWAYS FIND SOMETHING TO COMPLAIN ABOUT. I WORKED AT A TRACK FOR A FEW YEARS AND I KNOW FROM EXPERIENCE THERE IS NO WAY TO PLEASE THE RACERS. SO TAKE MY ADVICE AND DON''T ASK THEIR OPINION ON ANY THING. BECAUSE THEY WILL NEVER AGREE ON HOW TO RUN THE TRACK,JUST DO IT THE WAY YOU WANT AND IF THEY WANT TO RACE THIS IS WHAT YOU GOT. IF THEY DON''T LIKE IT FIND SOME PLACE THAT SUITS THEM. YOU WILL HAVE A LOT LESS HEAD ACHES,THAN IF YOU LET THE RACERS TELL YOU HOW TO RUN THINGS,RACERS CAN BE LIKE ANIMALS. BOB. Referring to the question on whether the Thunderbird drag strip is still operational. It is currently still open, but on a limited schedule. THE LEFT LANE WAS FIX TWO YEARS AGO STILL IS ROUGH WORKING ON GETTING IT BETTER SOFT SUSPENSION CARS HAVE NO PROBLEM CARS HAVE RUN MID 9''S IN LEFT LANE WE TRY 1/8 MILE DRIVERS DID NOT LIKE WE ARE WILLING TO DO WHAT THE MAJOR DRIVERS WANT SUGGESTION IS 1/4 ONE WEEK AND 1/8 ONE WEEK THE WIFE AND I WORK WITH THE OWNER VERY WELL ANY SUGGESTIONS WELCOME WE NEED TO KEEP IT OPEN OWNER IS WORKING ON CAR SHOWS AND MUSKEGON IS HAVING A HARDLY EVENT LOT OF THE ACTIVES IS GO TO BE AT THUNDERBIRD PLEASE HELP TO KEEP IT OPEN COST OF TOW FUEL IS HIGH AND YOU GET 4 OR MORE TIME TRAILS ON RACE DAY ALSO LOOKING INTO NEW TIMING LIGHTS I''L KEEP YOUS POSTED FEEL FREE TO EMAIL ME ANY TIME SUBJECT THUNDERBIRD BECAUSE OF JUNK MAIL THANK YOU CHUCK AND DE. 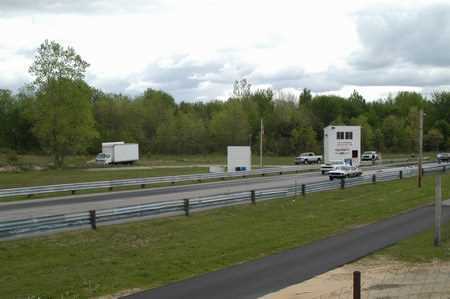 THUNDERBIRD IS OPEN FOR 2007 1/4 MILE 1 SUNDAY A MOUTH CONTACT ME AT DESBIRD@MSN,COM FOR INFORMATION JUST SET DATES SAT. PAVEMENT FROM RD TO STAGING LANES WILL BE DONE IN A MOUTH RETURN WILL ALSO BE REPAIRED HOPE TO SEE PEOPLE THERE MORERR CARS MORE RACE DATES WED TEST AND TUNE STARTS WED BEFORE MOTHERS DAY. Hey guys dose any one know for sure if ThunderBird is finished for good or if they plan on racing this year. Or how much they are asking for the place? Bill. Right on brother woods! these people will really be crying when the drag strips are closed. support your local dragstrips. 'cause when they're gone, they're gone for good!. I don't know if it is true but i heard the place is up for sale again. I hope someone gets it that will fix the place up,and put some repairs in the place. Frank, I can't get a hold of any one that works there to find out for sure. I heard that they were finished for good but we will have to wait and see. Jim. Tom, you don't understand this place is so run down. the strip and the speedway,are just in bad shape and it looks like no one could care. it wouldn't take much to spruce the place up some. does anyone know if the strip will be open in2007? thanks Frank. I SEE A LOT OF PEOPLE COMPLAIN ABOUT ALL THE TRACKS. LET ME GIVE YOU SOME GOOD ADVICE,IF YOU WANT ANNY RACE TRACKS LEFT INSTEAD OF COMPLAINING YOU SHOULD SUPORT THEM, 1/2 OF THE DRAGSTRIPS ARE GONE AND 3/4 OF THE SPEED WAYS ARE CLOSED. THEY DIDN'T CLOSE BECAUSE THEY HAD TO MUCH BUSISNESS. BUT BECAUSE LACK OF IT. IT IS NEXT TO IMPOSIBLE TO GET A NEW TRACK APPROVED BY ANY LOCAL ZONING BOARDS. 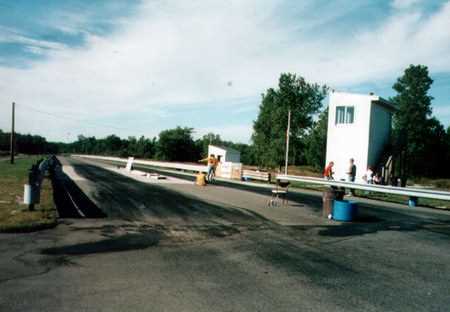 THE LAST DRAGSTRIP THAT I KNOW OF IN MICHIGAN TO OPEN WAS LAPEER DRAGWAY BACK IN 1968,MANY HAVE TRIED SINCE AND NO ONE HAS SUCCEDEED. AND IT DON'T LOOK LIKE THEY EVER WILL. SO IF YOU LIKE RACING STOP BITCHING AND SUPORT THE FEW TRACKS THAT ARE LEFT,BEFORE THEY ARE ALL GONE. TOM. Frank, Iwas there two times all they ran is test/tune there wasn't hardley anyone there. I don't know how they could take in enough money to keep it open. When a busisness don't take in enough to make it worth while they usually just let the place go tothe dogs like this,to bad. Kurt ,the place is so run down and unkept that if they are open i don't think they will get any business. To bad they let it get to this point. Frank. Does anyone know if Thunderbird will even be open next year? Or are they finished? The place looks real bad. Rod,You are so right. I raced 1/4 mile for 25 years and when some of the tracks started running 1/8 mile I said I would never race there. But I finally tried it and after I done it a few times I was hooked. For the last 5 years I race only at tracks that run 1/8 mile. Its the BEST and the SAFEST racing of all. Thank you for your in put. Jim Martin. I lived down south and for the last few years all the 1/4 mile tracks are going to 1/8 mile racing. When it is time to resurface you can do 1/8 mile for one third the cost of 1/4 mile track,because you dont need that long shut down. Also I read a study on safety between the two and it stated that 1/8 mile dragracing was not twice as safe as 1/4 mile racing but more than 10 times safer. So now I know why all the tracks are going to 1/8 mile racing. And most racers that race 1/8 mile for a time never want to go back to 1/4 mile. So it would be a good thing if Thunderbird went to all 1/8 mile dragracing. Rod. I Hate to see it go. I was there last fall and the track is real rough and bumpy, But if they resurfaced it would cost a lot of money. Maybe they could run 1/8 mile. and it would work. Just a thought. I see a lot of speedways are closing too. I guess the high gas prices and bad economy have a big efect on tracks. I hate to see all these tracks close. Will. FRANK, THATS TOO BAD HALF OF THE STRIPS ARE GONE. 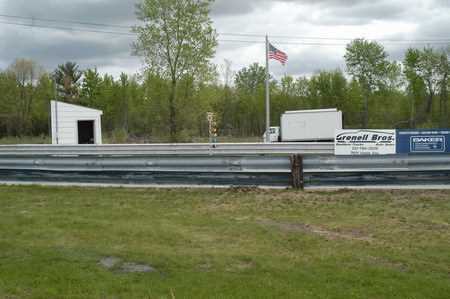 I HAVE BEEN GOING OVER TO LAPEER DRAGWAY,THEY RUN A GOOD NON STOP TEST & TUNE ON SAT. AND MONEY AND TROPHY ELIM. ON SUN. AND THEY ALWAYS SEEM TO HAVE A GOOD CROWD AND THEY TREAT EVERYONE FAIR. I LIKE IT THERE,GIVE IT A TRY. BILL. I HEARD THIS IS THEIR LAST SEASON, SAD TO SEE IT GO. ONE BY ONE ALL THE TRACKS ARE CLOSING UP. THERE WONT BE ANY PLACE FOR THE SMALL GUY TO RACE. Yes, the drag strip is still open. but they only do grudge/test-n-tune racing on wednesday nights. i was just at the track 8-5-06 while drving i saw a sign for thunderbird raceway and stoped the actuall dragstrip is in bad condition. Thunderbird is mostly a stock car track now it seems. HEY DOES ANY ONE KNOW IF THE DRAGSTRIP IS EVEN OPEN ANYMORE, THEIR WEB SITE IS GONE AND I HEARD THE DRAGSTRIP LOOKS IN BAD SHAPE, LIKE IT IS CLOSED AND RUN DOWN. TOO BAD. IF ANYONE KNOWS PLEASE POST IT. THANKS KURT. I made this Muskegon track my home track from 1976 thru 1981. I believe it opened sometime in the sixties and has opened and closed and reopened a couple of times and is currently open with a track resurfacing a couple of years ago. When I raced there the track was a little short and not real wide but was nice and flat. More flat than Martin or Stanton. About 1979 Doug Rose brought his Green Mamba jet car to town and on Saturday night at Thunderbird Raceway dirt track he did his car melt down show and on Sunday he made a couple of runs at the drag strip. During the week before, the track owners had a new asphalt burn out area put down just behind the starting line which was still to soft to use so it was roped off. Well, when Rose fired up his jet car, the thrust literally lifted up giant chunks of the new asphalt and blew it back toward an area of the pits. It was quite a site to see when those sheets of asphalt were blowing in the air what seemed like in slow motion. Luckily no people or cars were hurt. What a show. Yes the pit area can get a little damp when it has rained. The track was built up above the surrounding area.